The Bing Crosby Theater opened its doors on Feb. 22, 1915, and — along with the Liberty Theater on Riverside Avenue, which opened the same year — it brought the modern era of movie Theaters to Spokane. The Clemmer, as it was originally called, is an early example of the “palace theater” idea that was meant to legitimize the movies as important art and entertainment by giving it a beautiful setting. The Bing Crosby Theater is virtually unchanged since it opened 100 years ago. • An attempt by Thomas Edison and other inventors of movie-making equipment to control the production and distribution of movies was finally defeated in the courts. Filmmakers were released to experiment and competition spurred them on. • D.W. Griffith’s “The Birth of a Nation” premiered and set the standard for all future films. Griffith’s movie created the language of modern film, with thematic narrative, naturalistic acting, and “shots” inter-spliced to tell a smooth story. • Charlie Chaplin left his old film company and started making his own, more nuanced kind of film comedy. His “The Tramp” and “The Bank”, both released in 1915, set a new standard for comedies, just as Griffith had set the pattern for drama. • In 1915 theater owner Carl Laemmle traveled from New York to the tiny town of Hollywood, California, where he established the first modern film studio. His Universal Pictures Company was soon followed by Warner, Fox and MGM, and a new industry was underway. The Clemmer Theater played a part in this transformation of the movie industry. As late as 1912, the typical movie theater was a converted storefront with a sheet on the wall for a screen and benches for seats. Then a few New York entrepreneurs realized that it was not just the content of movies but also their settings that was limiting their appeal. These entrepreneurs built the first “movie palaces”, theaters that looked like opera houses and seated thousands. The first two were the magnificent Regent and Mark Strand Theaters in New York City, both built in 1913. The first of the luxurious Roxy Theater chain opened on Broadway in 1915. The idea was to shed the slightly disreputable image of movies and lure all classes to them. Just the fact that a more educated class started attending movies had an effect on their content. Movies moved from the amusement park model to the theatrical model. The Clemmer was in the first wave of this movie palace tradition. It opened before more famous theaters, such as Los Angeles’ the Million Dollar Theater (1918) and Grauman’s Chinese Theater (1922). The Bing Crosby Theater is one of only a handful of these very early movie palaces still in existence. Spokane came to have such a theater through the cooperation of two of its most interesting early citizens. The owner of the building was August Paulsen, a Swedish immigrant who struck it rich in Idaho’s silver mines. Paulsen invested much of his wealth in Spokane buildings, including the Clemmer. It was natural for Paulsen to approach Howard S. Clemmer to operate the theater. Clemmer’s father, James Q. Clemmer, was a pioneer in the business, having opened a small theater on Spokane’s Riverside Avenue in 1907. The senior Clemmer built the another Clemmer Theater in Seattle in 1909 and was the best known owner-manager of movie theaters in that city as well as Spokane. Like his father, son Howard Clemmer was a natural showman. A typical stunt he invented to bring attention to the Spokane’s Clemmer Theater was his “Red-Headed Club”. Boys with hair of that color got into a movie free once a week – in compensation, Clemmer explained, for the fact that life is harder for redheads. When Clemmer put out word during World War I that the club was open to every American soldier with red hair, The New York Times printed the story. In the spirit of the movie palace movement, Paulsen spared no expense in making the theater seem luxurious. Reviewing the theater at its opening, the Spokesman-Review commented “an atmosphere of richness is over everything.” The theater glowed with 1,600 lights. Murals on the walls were painted by Ivar Petersen, the muralist who had a year earlier painted murals is the Davenport Hotel. The acoustical shell over the stage, though built for function as a concentrator of the organ sounds, gave “an elaborate architectural effect” and “is the first of such design to be installed in any theater.” (Indeed, 90 years later architectural historians surveying the building as a part of statewide survey of old theaters said they had never seen another one like it). A ventilation system continuously pumped stale air out and fresh air in. In the summer the air ran over cakes of ice to cool the building. The pipe organ – an integral part of pre-talkie movie theaters – was installed by the W.W. Kimball Company of Chicago. It was a four-manual organ, “the only one of the kind in a moving picture theater in the Pacific Northwest,” according to the Spokesman-Review article. With hundreds of individual tones issuing from the 3,000 pipes that filled a space that measured 18 by 40 feet, the newspaper article said, the organ could produce a sound as large as a 40-piece orchestra. One of the first people to play this organ was Jesse Crawford, later to become the most renowned theater organist of the silent movie era. Crawford, a roaming piano player, “had never played organ before,” says an article in the American Theater Organ Society journal, “but when he got a job playing for the Clemmer Theater. . . . which had both piano and seven-rank Estey organ, the die was cast.” Crawford was later a feature performer at the Million Dollar Theater in Los Angeles and the Paramount in New York City. After its first decade, The Clemmer was scooped up in a campaign by movie studios to own the theaters where their films were shown. Paulsen and Clemmer sold their interests to Carl Leammle’s Universal Studios in 1925. The new manager, Roy Boomer, decided to try to generate interest by hiring live acts to perform between movies. One of the performers he hired was a local jazz drummer and sometime singer by the name of Harry Crosby (See “Bing at the Clemmer” on this webpage). In 1929, Universal sold the theater to a new Spokane owner who renamed it the Audian. Two years later the theater changed hands again and became the State Theater. Operating under that name for the next half century, it became a fixture of Spokane’s entertainment scene until it closed as a movie theater in 1985. 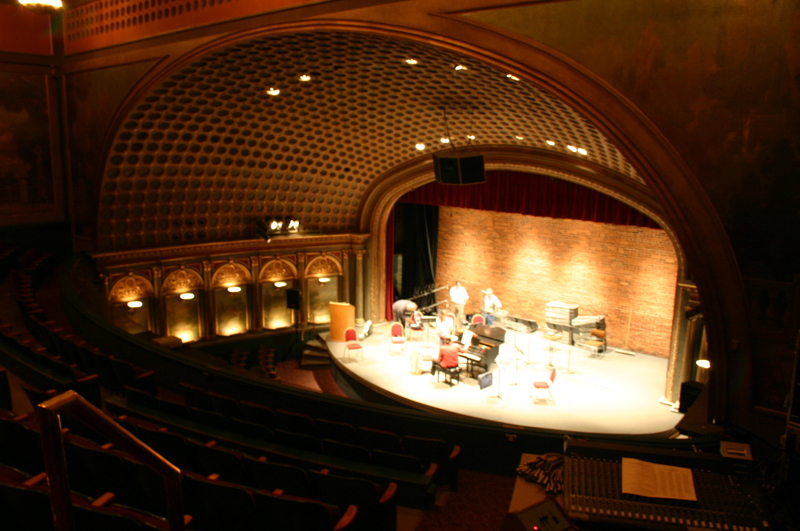 When its sponsor, the Metropolitan Mortgage Company, went out of business in 2004, the theater was purchased by Spokane businessman Mitch Silver and continued its roll as a venue for touring shows and for local organizations that use it as their home stage. In 2006, a citizens group received Silver’s permission to rename the theater and raised money to build a new marquee. It has been The Bing Crosby Theater ever since.